What would happen in a world where the interest rate on borrowings is 60% per annum? Indebtedness, daily struggles, failing businesses, anxiety; this is the reality for millions of Indian poor. Lata works in my house and a few months ago she borrowed a sum of INR 1 lakh for her son’s surgery from a local moneylender, at an interest rate of INR 60,000 per annum. Contrast this with the average lending rate in the formal banking sector which ranges from 11% to 24% per annum. “Life is good otherwise. My husband and I earn enough to support our family. However, this loan gives me anxiety. I have a feeling that I will be paying this interest for the rest of my life.” says Lata. Credit is necessary to ensure the dignity, shared prosperity, financial stability, and secured well-being of people. It provides access to education and healthcare, a means of undertaking business, and fulfils emergency needs. However, predatory lending often inhibits the growth and cash flows of the poor, strangling them with a lifetime of debt. A seven-year-long longitudinal impact study commissioned by SIDBI discovered that the poor – without access to formal sector loans – pay an interest rate of 60% per annum or more to moneylenders on an average (EDA, 2004). In spite of this huge interest payout, nearly 20% of the loans in rural India and 16% of the loans in urban India are sourced from moneylenders alone (IHDS-II). In our country, where finance is seen as the backbone of economic growth and a means of elevating residents out of poverty, it has become imperative to eliminate the widespread influence of informal credit. This begs the question: why do a majority of the poor still depend on the informal sector? After all, there has been tremendous growth in the microfinance sector and the government has taken multiple steps like the implementation of many credit-linked poverty alleviation programmes and a mandatory system of priority-sector-lending to promote formal sector lending to the poor. The major possible causes of this problem include a combination of people and systemic issues. Lack of education and knowledge, difficulty in accessing formal sources of credit, absence of collateral, and possible inhibition to enter bank buildings could be some of the people or sociological issues. Additionally, it is much easier to obtain loans for purposes such as marriage and litigation from informal sources. Systemic factors of the formal sector include lengthy paperwork, fixed repayment schedule, which does not meet the needs of the poor with irregular income, and unwillingness to extend credit to the poor due to the uncertainty of repayment capacity and lack of data to ascertain their credit ratings. Informal sources, on the other hand, do not require timely repayment, do not have complicated rules governing the granting of loans and are willing to lend freely without collateral. This makes them a preferred source of credit. In order to affect a transformative change in the credit availability from formal sources to the poor, a multi-layered approach needs to be taken. It should involve changing the mindsets of all the involved stakeholders including the poor, formal sectors banks and microfinance institutions. For instance, a study funded by UK Aid showed that flexibility in microfinance contracts led to higher repayment rates. The widespread use of Aadhar card and linked PAN cards has eased the process of opening of bank accounts, filing ITRs, availing SIM cards and performing e-KYC. These technology-linked systems along with the digital revolution seen in India can be leveraged to collect data to reasonably gauge the risk of non-repayment from every individual. Microfinance institutions can optimise these technologies to make finance readily available without compromising on due diligence. The digital revolution can also be harnessed to educate the masses regarding the benefits of formal finance. Ultimately, a nation’s advancement is measured by how rapidly its poor advances out of poverty, and this is especially true for a country like India with 364 million poor (2018 MPI). A steady and flexible source of formal credit could be a key to raise the status of the Indian poor. It will provide them with an opportunity to start new enterprising activities and will bring about positive changes in their livelihood patterns by inculcating in them the habit to save, reducing their dependence on predatory lending, and fundamentally improving their standard of living. This could be the story of millions of other poor people like Lata, to whom we as a nation have a responsibility to empower. Aishwarya Heda is part of our Transformation Advisory team and works from our Bangalore office. She is a graduate from Shri Ram College of Commerce, Delhi. Before Sattva she has interned at a financing firm in Mumbai followed by a 2-year stint as an Investment Banking Analyst at Goldman Sachs. 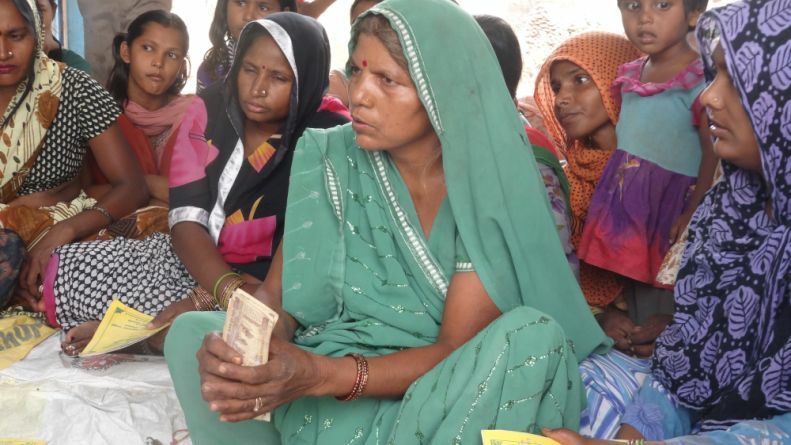 Read about Sattva’s work in demonstrating how financial empowerment through digital financial inclusion can make a social impact here.